The government and the Travancore Devaswom Board have made all arrangements for the Sabarimala Makaravilakku which falls on Friday. More security forces has been deployed in Sabarimala. 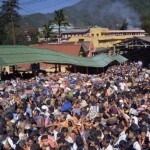 Elaborate preparations had been made to supply food and drinking water to the pilgrims queuing up to reach the Sannidhanam. Forest undercover had been removed to provide space for pilgrims to witness the Makara Jyothi on Friday evening. Kerala Water Authority (KWA) had made arrangements to ensure unimpeded supply of drinking water from Pampa to the Sannidhanam. The KSRTC would ply more buses to meet the rush. Compared to the previous season, there was 10 per cent increase in the arrival of pilgrims this year.